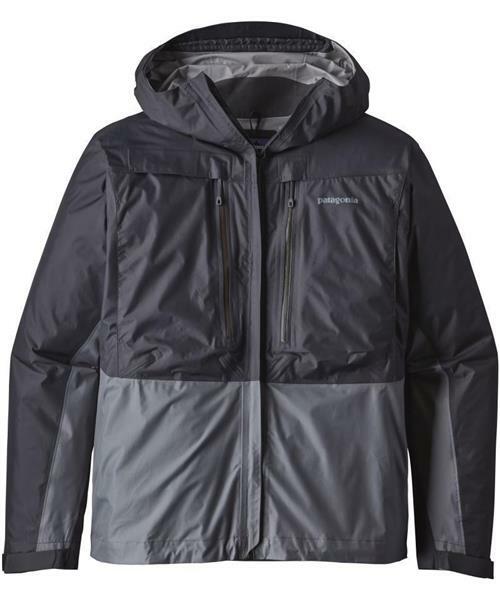 Patagonia's Minimalist Wading Jacket keeps you on the water longer with a rare combination of heavy-duty rain protection and ultralight performance. Made from durable H2No® Performance Standard 2.5-layer, 100% recycled nylon ripstop fabric with a waterproof/breathable barrier and DWR (durable water repellent) finish, the Minimalist sheds weather like other premium fly-fishing jackets but at half the weight. Two large upper fly-box pockets with highly water-repellent zips hold essential gear, and the two lower handwarmer pockets are at the ready to keep an off hand warm during the swing; zippers are sturdy plastic to prevent corrosion. Add in a fully adjustable hood and cuffs, plus a bungee drawcord at the waist, and it’s clear: the Minimalist is everything you need and not an ounce more. It’s also our longest fishing jacket, half an inch longer than the River Salt and 2.5 inches longer than the SST.